We had a wonderful day by the sea yesterday at VCOG's annual conference. At the Scripps Howard School of Journalism and Communication at Hampton University, audience members -- fairly evenly split among journalists, government folks and interested citizens -- engaged with panelists on topics like African-American genealogy, public comment periods at public meetings, access to police body-worn camera footage, economic development and a General Assembly wrap-up. 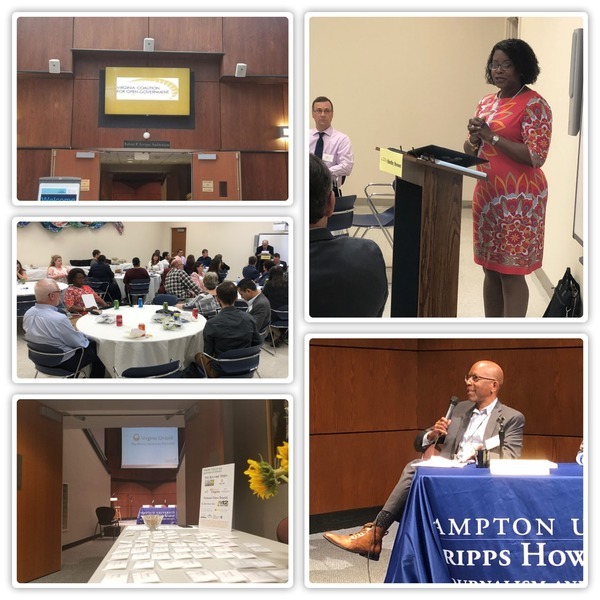 Lunch was in the education center at the beautiful Hampton Museum, where WTVR-Richmond on-air personality Shelby Brown told stories of how she and her colleagues were able to track down information to help ordinary citizens with what they felt were insurmountable problems. Thank you to all who came out and to all of our generous sponsors and donors! The Hampton Roads Regional Jail, which for years has been a dumping ground for many of the region’s sickest inmates, had a chance for change. Facing an ongoing federal investigation, jail officials worked frantically in the final months of 2017 to get legislative support behind a measure that would have given the jail $5 million in state funds to hire as many as 80 new correctional and support staff. But that budget amendment died mysteriously in a legislative committee. And the jail’s board members, many of whom were not happy the legislature had been asked for the money, did not push for a similar measure this year. By the board’s February 2018 meeting, the $5 million budget amendment had died in committee and then-Superintendent Ronaldo Myer’s budget request to the cities was cut back. Instead of the 11 percent increase in the amount cities pay for each inmate every day, he’d have to make due with 6 percent. There was no money for additional staff. What happened next is illustrative of how the board operates — refusing to come to grips with the severity of the jail’s shortages and blaming jail leadership for the problems. At the meeting, several members of the board made it clear they didn’t like the way Myers asked the legislature for the money. “You should’ve come to us first and had that discussion,” said Norfolk Councilman Martin Thomas, who would soon lead the board. Thomas did not return repeated messages for this story. “And that dovetails into another concern that I’d like to point out. Really, be careful about getting ahead of the board.” But Myers had been telling the board about the proposal for months. It’s in the meeting minutes from December 2017 and a draft of the legislation had been given to each member, including Thomas. Unlike three other conflict of interest lawsuits filed on behalf of clients against the Rappahannock County government by private attorney David Konick since 2016, it didn’t take long for the latest case — Harris Hollow resident George Sonnett’s suit against three Board of Supervisors and County Attorney Art Goff — to be dismissed by Rappahannock Circuit Court Judge Jeffrey W. Parker. The case, which rang in 2019, was dismissed during court proceedings Thursday after Judge Parker sustained one dispositive demurrer. In his Petition for Declaratory Judgment, Sonnett had charged the three supervisors and Goff with violating the state’s Conflict of Interest Act (COIA) on several occasions last year when considering the appointment of Peter Luke as Deputy County Attorney — ironically to help handle the workload of previous lawsuits filed against the Rappahannock County government. Brad Pitt learned that "cut" doesn't apply only to movie sets. The actor spoke out in support of proposed improvements of the Los Angeles County Museum at a Los Angeles County Board of Supervisors hearing – that is until he got cut off. Pitt, 55, went over his allotted time during his speech, and board member Janie Hahn had to tell the "Once Upon a Time in Hollywood" star to wrap it up. "I see my time's expired, I could go on for another hour," Pitt said. "It gives me great pain to say it but wrap it up Mr. Pitt! It kills me to say that, but wrap it up," Hahn said with a laugh.